Russell Wiley is in deep trouble. A media executive for the failing Daily Business Chronicle, his career is teetering on the brink of collapse, and his sexless marriage is fast approaching its expiration date. With his professional and personal lives floundering, it’s no wonder Russell is distracted, unhappy, and losing faith in himself. Making matters worse are his scheming boss, a hot-shot new consultant determined to see Russell ousted, and the beguiling colleague whose mere presence has a disconcerting effect on Russell’s starved libido. Disaster seems imminent…and that’s before he makes a careless mistake that could cost the paper millions. Russell realizes he must take drastic action if he is going to salvage his career, his love life, and what little remains of his self-respect. Sardonic, edgy, and true to life, this gripping novel offers an insider’s view into a newspaper's inner sanctum and the people who oil the wheels of this increasingly outdated machine. London-born Richard Hine began his career as an advertising copywriter After moving to New York at the age of 24, he held creative and marketing positions at Adweek, Time magazine, where he became publisher of Time’s Latin America edition, and The Wall Street Journal, where he was the marketing vice president responsible for the launch of the Journal's Weekend Edition. Since 2006, Hine has worked as a marketing and media consultant, ghostwriter, and novelist. His fiction has appeared in numerous literary publications, including London Magazine and Brooklyn Review. He lives in New York City with the novelist Amanda Filipacchi. Clearly, Russell has to make some major changes. Making a mistake in a spreadsheet, a mistake that is going to cost the company millions of dollars, wasn't the major change he would have chosen. This is light, funny, a great distraction from paying attention to today's news! Really, it's just a lot of fun. Recommended. This is an entertaining novel, a fast read, not deep but still with a bite to it. Told from the first person perspective of Russell Wiley, midlevel manager at a declining media (mainly business newspaper) company, it humorously narrates the internal politics of an organization that is incompetently run and slowly falling apart from the rot of distant management and lower level politics. In short, anyone who has ever worked for a large organization - public or private - will see him/herself and his/her own struggles to stay afloat against a tide of entropy. Even though Russell Wiley works for a fictional second-tier media company and my career was in the public sector, I felt and recognized (and often laughed at) every twinge of his daily challenges and frustrations. For that alone it was a worthwhile read. Parallel to Russell's professional discontent, his marriage is also slowly falling apart and as a consequence he begins to eye the available women in the company. My only complaint about the book is the ending, which is largely a disconnect (and therefore not very realistic) from the rest of the narrative, but which neatly resolves Russell's professional and personal grievances in one neat little (and unpredictable) package. If you want a light and entertaining summer read, this is a book worth throwing into your beach bag. Office politics and the incompetence of the business world always makes for amusing storylines, which is why television shows like The Office and books like Joshua Ferris' And Then We Came to the End are so popular. 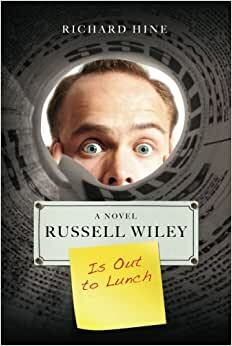 Into this arena comes Richard Hine's Russell Wiley is Out to Lunch, an enjoyable and fun story of a newspaper executive struggling with dysfunction both at home and at work. While I've never worked in as large a corporate environment as the one Hine describes, there were certainly aspects of dysfunction I've recognized through my career. I found all of the characters enjoyable (although Russell's wife isn't fleshed out nearly enough, so you never get the chance to understand why she's so angry with him) and definitely was compelled to keep reading. My one issue is that the book has been reviewed in many circles as being "as hilarious as The Office," and I don't see that. True, I rarely find things to be as hysterically funny as I'm told they will be, if the book was written to be uproariously funny I believe it fell short, but I did find it amusing and fun, and a very quick read. I picked this book for a quick read with hopes of some laughs in between other endeavors. That's exactly what I got. I was drawn in with the failing newspaper - in a world of electronics I still love paper in my hands so I was interested in what happened in this vision of the dilemma. Like the newspaper business, this story seemed to pull me along, but just barely, for quite some time. The highs were not high, the lows not low, there was some humor and some intrigue but most of it was predictable. Still, I ended the book with a smile and was interested enough to keep reading in stolen moments ( my barometer of interest is how often I want to read). All in all, it delivered as promised. So, if you have any interest in the plight of a mostly likable, somewhat pitiful, struggling newspaper marketer and how he survives life in the thirty-somethings, this one's for you. I read RW a year ago during the Amazon novel contest. I have worked in the marketing dept. for a nonprofit and also done a few stints as copywriter at some ad agencies. So much of this book brought back memories of that kind of culture. The author affectionately satirizes the dying newspaper world struggling to reinvent itself. The character of Russell Wiley may not always be heroic but he is always recognizable. He's someone we've worked beside or someone we've been. A thoroughly enjoyable read that tickled me and offered a tiny bit of hope and redemption along the way. which is about a human embryo that's allowed to preview the world before deciding whether to be born.